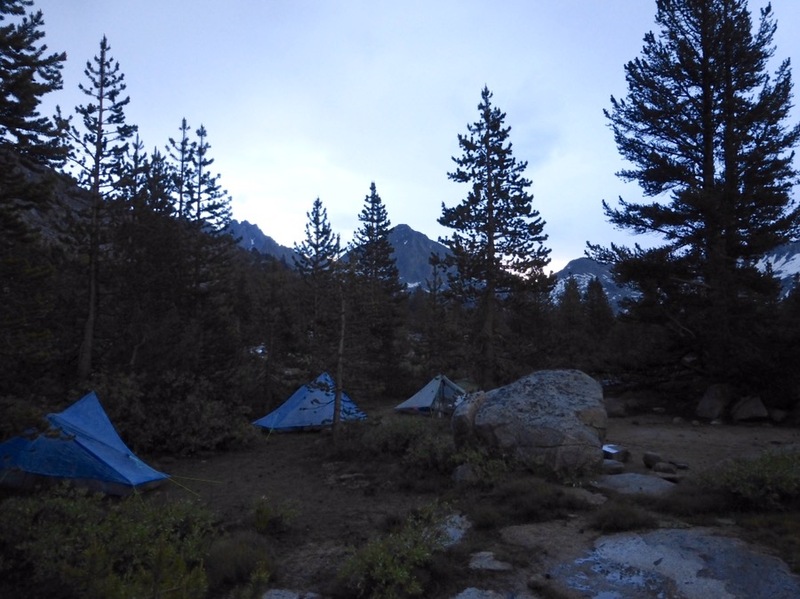 After a week of the Sierra High Route, I’m finally feeling at home. It’s deceiving though, because I’m technically not on the SHR today. 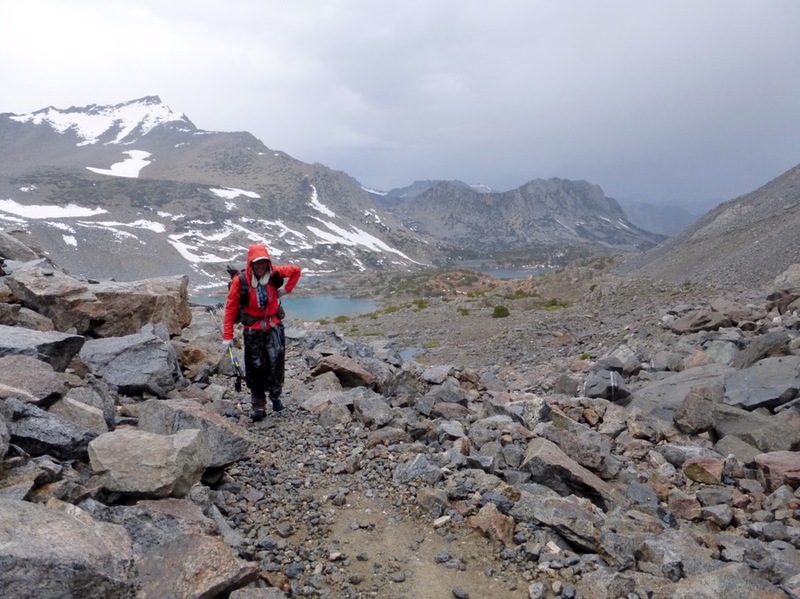 We had exited off the Bishop Pass side trail to resupply, so we needed to hike the arduous 7mi back up over Bishop Pass and then do another 3mi to connect back to the SHR route. So technically, on my total mileage of the SHR, we did zero for the day when we really did 10mi. I do love zeros and yesterday was great. What made it even better was that we weren’t going to start hiking today until the afternoon. We needed to wait for Rockin to return from her home in Tehachapi and we also were trying to leave as late as possible to minimize the intense heat we experienced going down that trail the other day. 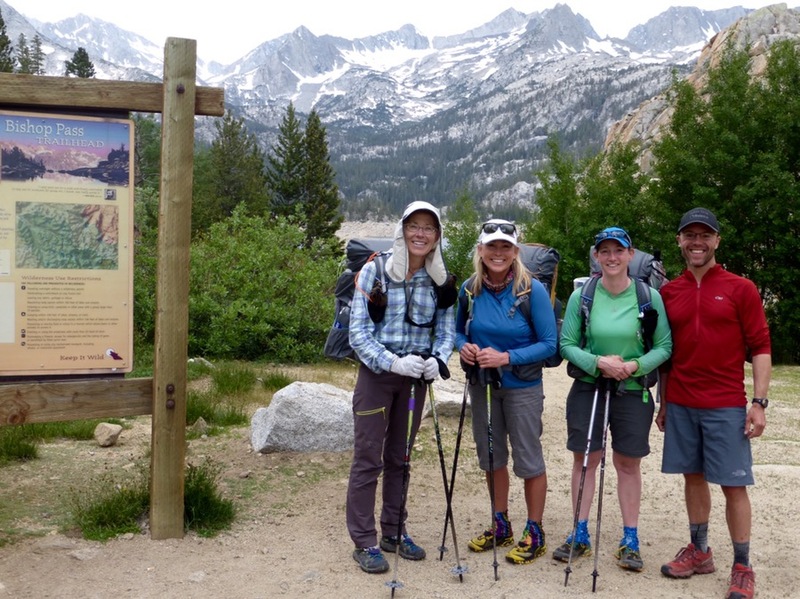 It was still over 100 degrees in Bishop and we really dreaded hiking up with a full week of food in our packs. It’s only a 2,100ft climb over 7mi, but it goes from 10,000-12,000ft and that’s really tiring. So for the first part of the day, Why Not and I got to chill in the room and catch up on things. It’s ridiculous how time consuming blog and town chores can be. My goal was to watch the final four episodes of VEEP. That show really is hilarious. I only got through 2.5 episodes, so I have to wait til I get to Mammoth in a week to watch the last 1.5 since they are online. Dang! Fun news for the day is that we had a ride back to the trailhead (30mi) from a fellow SHRer. John started the SHR southbound around the same time as us and we’ve been in contact as we each have been planning. He lives in Seattle and we never met, so it was going to be fun to meet as we were each headed towards each other. 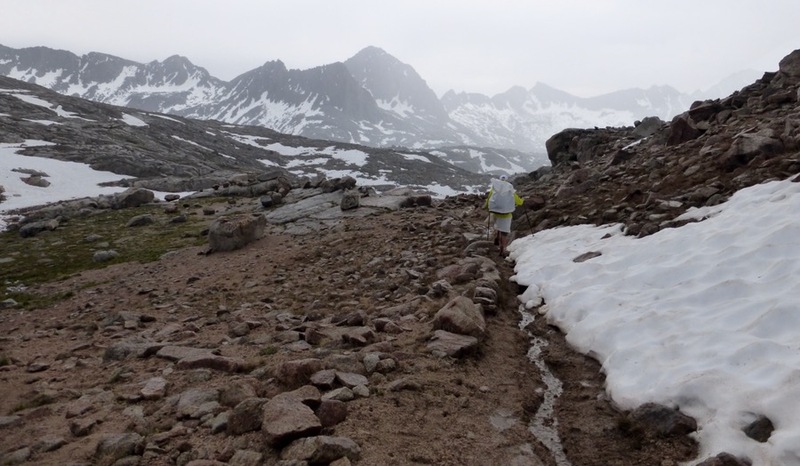 Unfortunately, John had to leave the route after 5 days due to a combination of pushing too hard too early, and some ailments similar to some of ours. He was on a limited time away from work to complete the SHR and he needed more days to recover than his schedule allowed, so he decided to give it another go next year probably. 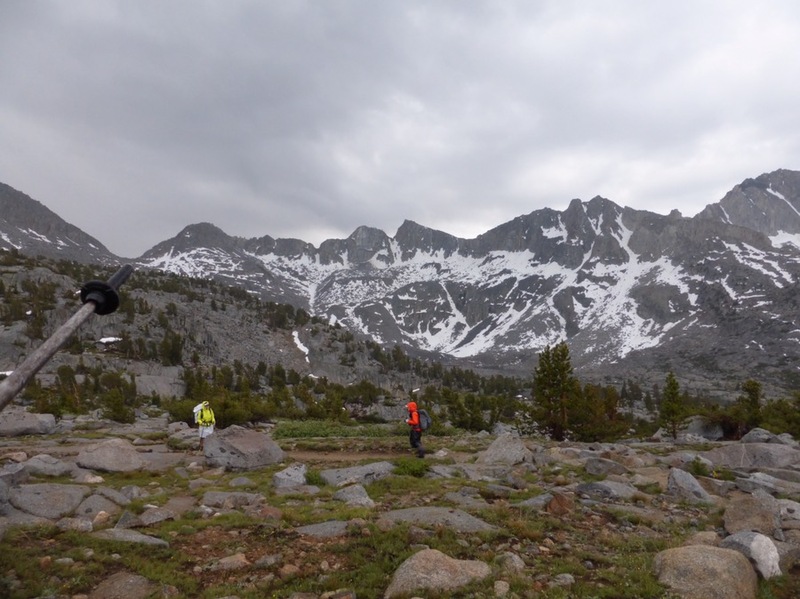 So, since John was in the area and had some free time, he offered to shuttle us back to the trailhead and he hiked in with us a bit. THANK YOU John for the ride and for visiting with us! Bishop Pass Trailhead at South Lake with John. The forecast for the next few days is 40% chance of isolated thundershowers. This is common in the Sierra and they are usually short lived. 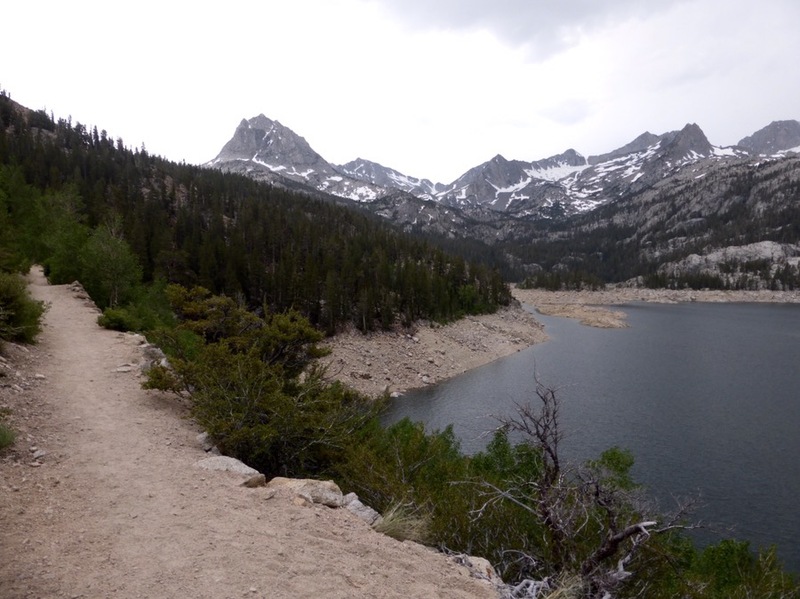 When we left Bishop, it was over 100 degrees, and as we drove to the trailhead, the clouds gathered (it can happen quick out here) and it started to rain a bit. By the time we got to the trail, it was 60 degrees! We were so lucky! We got started at 3pm and it was so much easier without the intense heat! We all are feeling good after the rest. It turned out that Rockin’ had a double ear infection, a sinus infection, and she got an inhaler for her lungs that are aggravated by allergies. Again, you never would have known it with how speedy she’s been. Now she’s really going to take off! 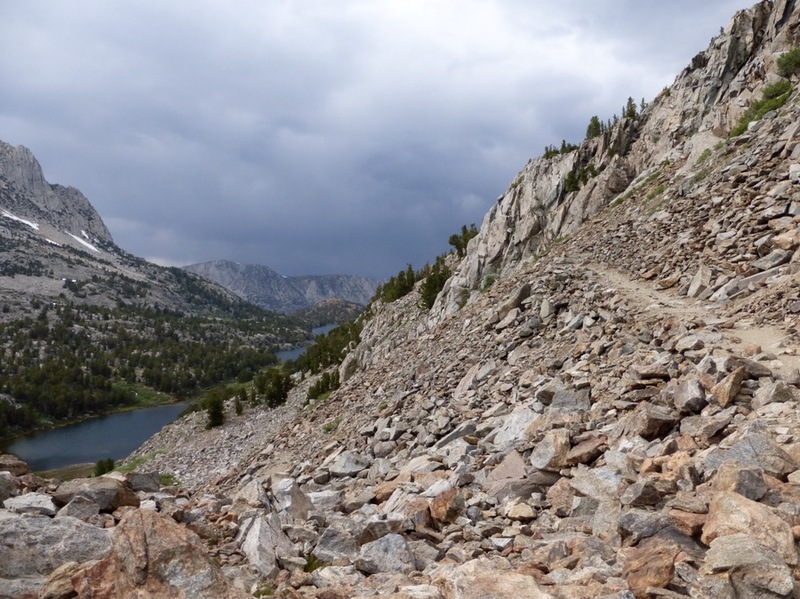 It rained and thunder rumbled on and off as we hiked up over Bishop Pass. Once up there, we hiked through Dusy Basin to where the SHR reconnects. We were feeling good, and started later, so we pushed a bit later than usual. 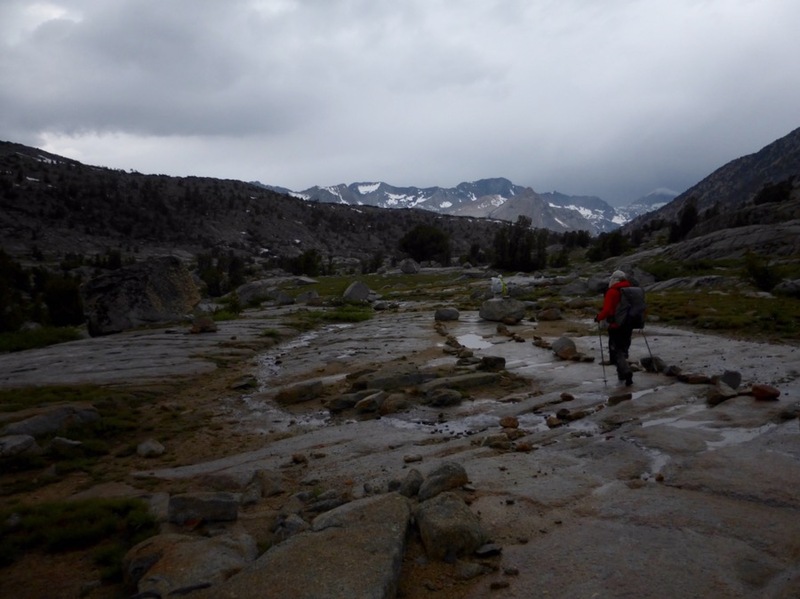 Knapsack Pass, the pass we came over before exiting at Bishop Pass. Then the rain really started to come down. We found a spot at 7:45pm at the last possible space before a ton of downhill switchbacks we’ll do in the morning to enter LeConte Canyon. Happy to have found a sheltered spot as rain came down. We all were pretty happy with our mileage and our swift setup in the rain. I’m starting to feel like myself and actually had bonus energy when we got to camp, so that’s a relief that things may be turning around. 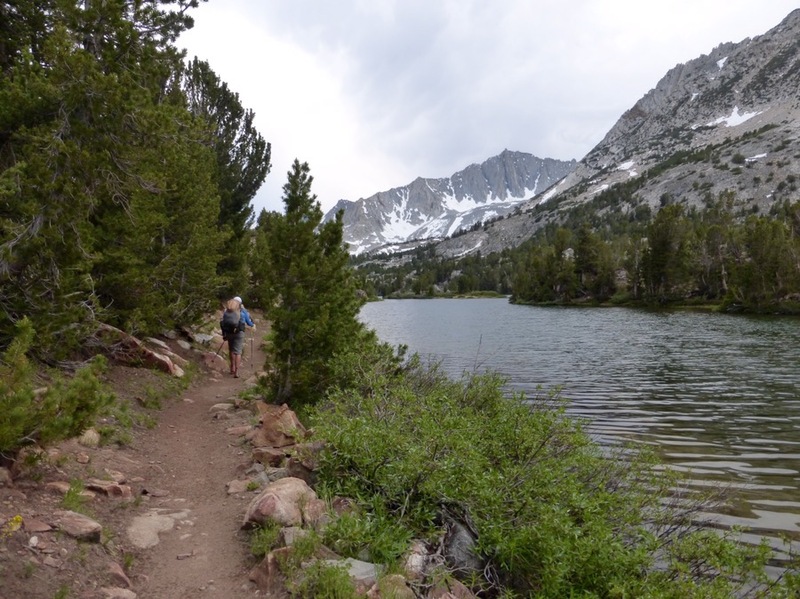 Tomorrow is mostly all on the John Muir Trail, so that will be great! I’m glad you are all feeling well. Your blog is great as usual and you all seem to work so well together. I met a young lady at the Luxor Hotel in Las Vegas Saturday night. She was walking in the parking lot with a full backpack and carrying a bear canister in her hands. 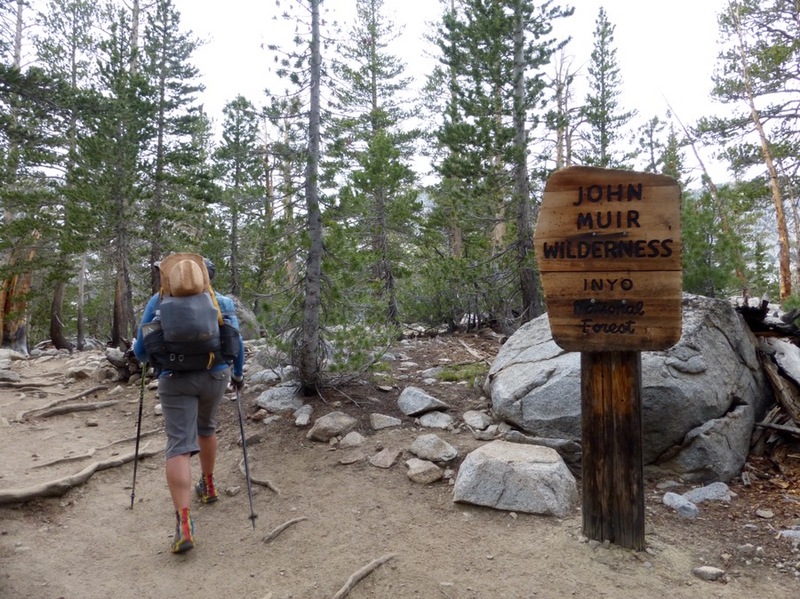 She was from Pennsylvania and is going to I hike the John Muir Trail. She wanted to stay in a nice hotel her final night before driving to Yosemite. She seemed very excited and I wished her a wonderful trip. Sounds like things are turning around for you. Awesome!